This has been a good cow for us and calves every year. 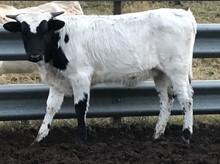 Exposed to Big Sky Silver Saddles for a 2019 calf. Grulla, grulla and more grulla! No guarantees that the calf will be, but we’re stacking the pedigree, hopefully the color will be a bonus! A nice grulla and white Top Caliber daughter that is gentle. She's exposed to Big Sky Silver Saddles for a 2019 calf. "Hooks" is a good mother and consistently raises nice calves.